Kevin Kewley grew up hearing stories of his parent's "infamous parasail" they'd use in an uncommon sport called off-road parasailing. Lured by tales of high-flying adventure he decided to try it himself. The results are amazing if not a little terrifying. Like most other forms of parasailing, off-road parasailing involves a person being towed behind a vehicle in a specially designed parachute/sail at speeds fast enough to cause the chute to lift. Unlike the most common form of parasailing, off-roaders use 4x4 trucks instead of boats. "I found this [sail] for $500 on Craigslist and a few hours later me and a friend were the new proud owners," said Kewley. "I remember the sellers being a bit confused when they asked what kind of boat we have and I answered by saying we don't have a boat, but my Xterra should do just fine." The Xterra itself, named Penny, is a modified 2008 Off Road version with upgraded suspension, tires, a light bar, and a tow hitch that's just as good for pulling a parasail as it is for helping other trucks get unstick. 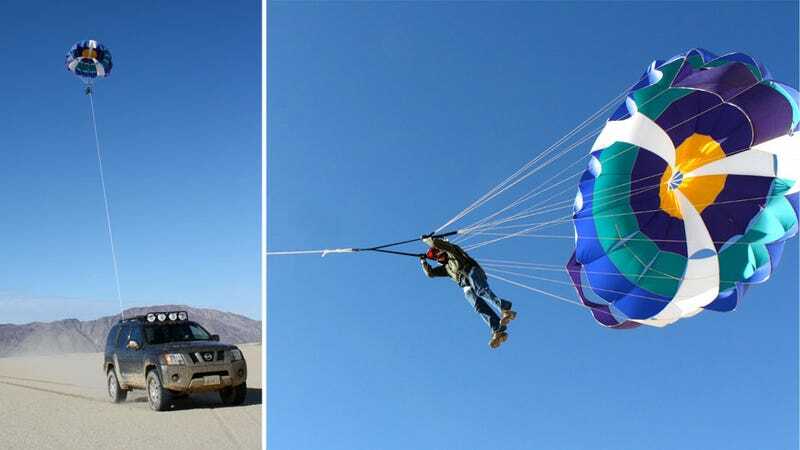 Though it makes a good parasailing vehicle, he says other trucks could work as well. A regular car, however, would probably not work. The biggest necessity in doing this type of parasailing is space, which is why boats are so popular for the activity. The distances needed to keep a sail in the air and then gently slow it to the ground are great, so Kewley and his friends use trucks in the middle of the desert. "We try to map out a big loop, keeping in mind that the car will have to drive at least 25mph to keep the parasail flying. Depending on the area it can make for some intense off-roading," said Kewley. "We once got all four tires off the ground trying to keep it flying." It requires a crew of people to safely guide and maintain a flying sail because hardened desert is a little less forgiving than water. "We always start the parasail directly downwind from the vehicle, if not the whole canopy will swing itself downwind once it's off the ground. Once the rider is suited up and harnessed in the car will slowly pull forward until the 200ft rope is taught. With two people holding each side of the parasail canopy open the driver will pretty much floor it. The rider will just take a few steps forward and then is launched skyward pretty quickly, it's always one of the best parts of the ride; going from a standstill to 150ft up in a few seconds. In the back of the car we'll have someone keeping an eye on the parasail, constantly telling the driver it's altitude. If the terrain gets too rough, and the parasail starts dropping to 50, 40, 30ft, the driver will know he's got to pick up the pace or things will literally come crashing down. To mix things up a bit we've started deliberately slowing down and speeding up, it causes the whole parasail to go up and down. To land, the driver just gradually slows down, with the co-pilot relaying the altitude." What happens if you miss the jump is you end up in a tuck-and-roll situation he describes as "jumping off the roof of a house holding an umbrella." This danger gets to the heart of why, outside of some crazy Europeans, off-road parasailing is an extreme sport for extremely few on this continent despite the relative ease and safety of traditional on-water parasailing. "So far the only accident we've had is someone getting dragged a few feet when the rope wasn't completely taught during takeoff, they we're OK though," Kewley assured us with a touch of understatement. "Besides that no injuries so far, it is pretty dangerous though." The dollar-per-thrill ratio is in favor of the thrill-seeker, as is the case with most off-roading adventures, as the equipment requirements are low. "You just have to be crazy enough to parasail behind a car on land." We're not sure if any of us here are crazy enough, but we are grateful those who do bring cameras with them.